Abstract: Since the beginning of the industrial revolution, massive amounts of CO2 have been released from factories, vehicles and energy stations, causing a rise of CO2 levels in the atmosphere. In addition to the pollution issue and the health concerns related to the presence of excess CO2 in the air1, CO2 is also known for causing a positive effect in the heat retention of the atmosphere, taking then, part in global warming2. On the other hand, more than 80% of the energy consumed by the U.S. has been produced from hydrocarbon fuels such as coal, natural gas and petroleum3. Because of this, and the energetic properties of hydrocarbons such as high energy density, easy transportation and stability4, it is of interest to find new methods that will readily provide this kind of fuels for future use. Electrochemical reduction of water dissolved CO2 provides a solution to both the environmental and energetic issues. The transformation of CO2 and water into hydrocarbons decreases the amounts of CO2 in the environment and generates a ready-to-use energy source. In order to successfully achieve a nonpolluting water treatment process, the energy source for the electrochemical reduction must come from a renewable source of energy. Otherwise, if the energy needed for the electrochemical reduction were obtained from hydrocarbons, there wouldn’t be a clear net benefit for the environment. Electrochemical reduction of CO2 .to hydrocarbons would, in a way, allow for storage of the solar energy in form of chemical energy, which would eliminate the need for batteries for its storage, like most solar cells do. For this reason, the produced hydrocarbons have been coined with the term of “Solar Fuels”. 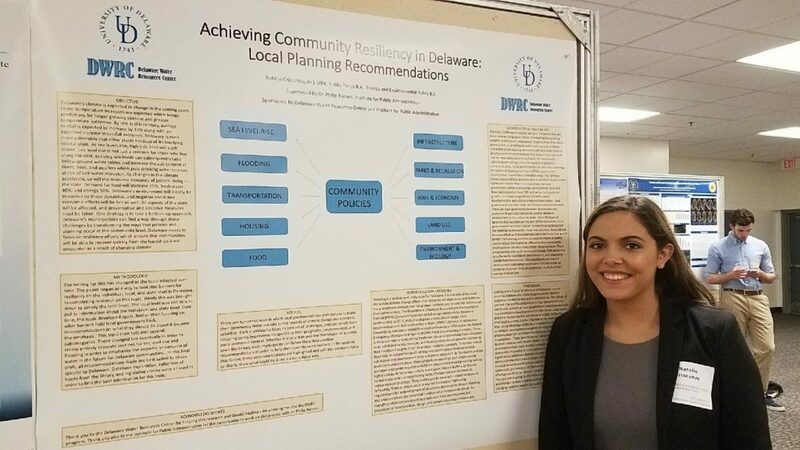 Abstract: With predictions for climate change all over the world in the coming years, Delaware needs to be a state that adapts. It is important to look at the combination of policies and planning when discussing climate change in order to see how local municipalities can deal with the issue. This paper initially began looking at individual, municipal, and state levels of planning sustainably. As federal and state level initiatives can sometimes be backed up by red tape, it is best to look at what local communities can do now in order to not only make changes to prepare for the consequences of sea level rise, but also what they can do to increase their town’s overall sustainability. The two largest sections of recommendations fall under sea level rise and flooding, as the issue of water creates some of the most urgent and large-scale problems in Delaware. The state is incredibly vulnerable to the upcoming risks of sea level rise and the increased flooding that comes with it since all of Delaware is at less than 500 feet above sea level and all counties have coastline. Other sections include recommendations on housing, food, land use, transportation, and infrastructure. The focus in each section is community policies that can positively affect a town both environmentally and economically. Recommendations range from implementing stormwater fees to using low impact development techniques. The current planning choices in Delaware are no longer acceptable, and needs to evolve. There does not need to be a choice between a resilient community or an economically flourishing community. Delaware can take advantage of numerous policies and planning guidelines in order to have both. While there is much work to do, this subject is constantly changing as policies on the state and federal level change as well. 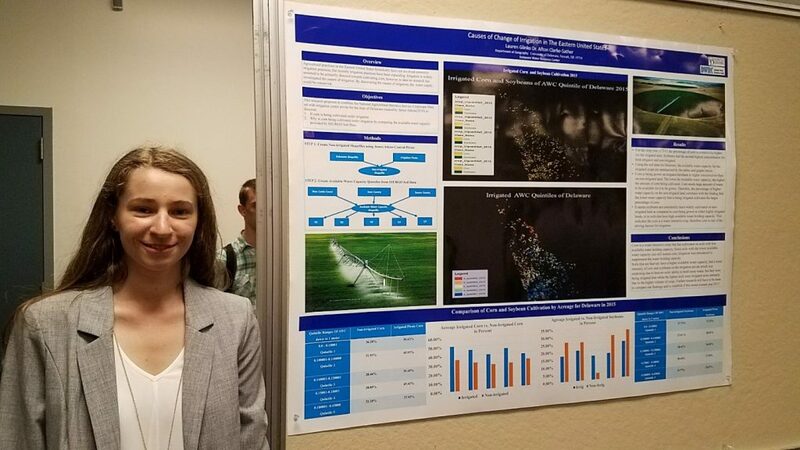 Abstract: Irrigation historically has not occurred on the East Coast of the United States, but in recent few decades, irrigation has begun to occur on the East Coast. It has been assumed that corn has been the driving factor of the irrigation wave on the East Coast, but there has been no empirical data supporting this. Our goal was to analyze this increase of irrigation in Delaware using irrigation points (year 2010, created by James Atkins approximately 2000 center pivots) along with National Agricultural Statistics Service Cropscape Data for the year of 2015. These datasets would then be extracted to highlight the crops grown on irrigation pivots and then compared the available water capacity derived through the SSURGO Web Soil Survey. The water capacity data was broken up into quintiles to discover which of the ranges held more corn. The soil that had lower available water capacity had a significantly larger amount of corn grown on irrigated land, which was surprising because this usually represents a lighter soil that can hold less water. The heavier soils which have a higher capacity of water available, cultivated less corn which is surprising because these soils can hold more water, but they cultivated less corn on these soils. This trend was continued with the soybean crop as well. Research is recommended for the 2013-2010, 2008 and 2002 available Cropscape data, along with further research to compare Delaware’s irrigation to the historic irrigator Minnesota. Abstract: Estuarine wetlands provide many ecosystem services and have the ability to sequester carbon from the environment. Estuarine wetlands are also large sources of methane emissions. 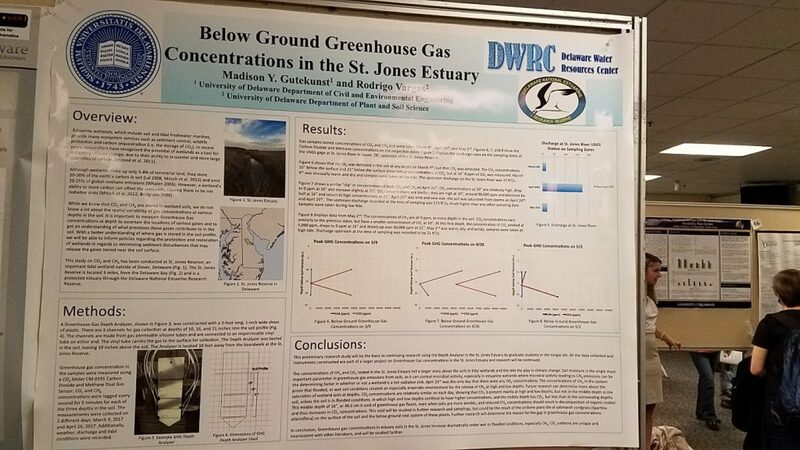 This project seeks to investigate the below ground greenhouse gas concentrations, specifically methane and carbon dioxide to gain a broader understanding of what is occurring at varying depths in a tidal marsh, specifically the St. Jones Estuary near Dover, Delaware. A greenhouse gas depth analyzer was built to carry gases to the surface of the soil, to be tested using a CO2Meter CM-0191 Dual Gas Sensor. The analyzer was buried in the soil at the St. Jones Reserve and concentrations at depths were collected on 3 different dates. The project found a layer in the soil profile that seems to emit less greenhouse gases and that methane is only produced in the tidal marsh on high flow days when the soil is completely saturated. This preliminary study will continue in the Vargas lab, and more tests will be done to provide an in-depth analysis of the gases underneath the soil in the St. Jones Estuary. 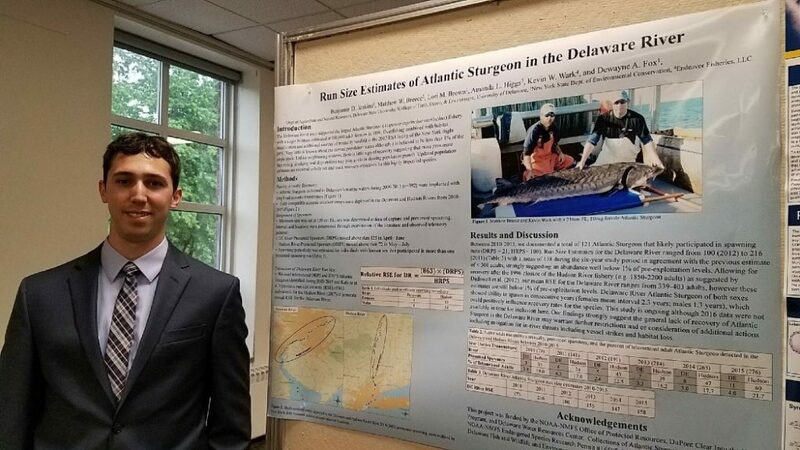 Abstract: Atlantic Sturgeon (Acipenser oxyrinchus oxyrinchus) were once abundant in most major Atlantic coastal rivers, but overharvest and habitat loss eventually led to their 2012 listing under the Endangered Species Act. Although the Delaware River once supported the largest population, its present status is poorly understood and was estimated at less than 300 annual spawners in 2007. The Hudson River population has been extensively studied and supported an estimated run of 863 individuals in 1996 prior to the close of the fishery in 1998. We estimated run size in the Delaware River relative to the published Hudson River estimate using an at-large population of 392 telemetered individuals and acoustic arrays deployed in both systems from 2010-2015. We determined likely spawners by size (≥150 cm FL) and occupancy of presumed spawning regions during known spawning times. Relative run size estimates for the Delaware River ranged from 100 (2012) to 216 (2011) with a mean of 158. Ten likely spawners (four females and six males) returned during multiple years to the Delaware River while 44 (10 females and 34 males) did so to the Hudson River. We recorded 2-3 years between spawning events for Delaware River females and 1-2 years for males. In the Hudson River, we saw 1-2 years between spawning events for both sexes. Our findings suggest that the present Delaware River population of Atlantic Sturgeon is less than 1% of pre-exploitation levels, heightening concern given ongoing habitat modifications (e.g. dredging) and sources of mortality (e.g. vessel strikes) in the system. 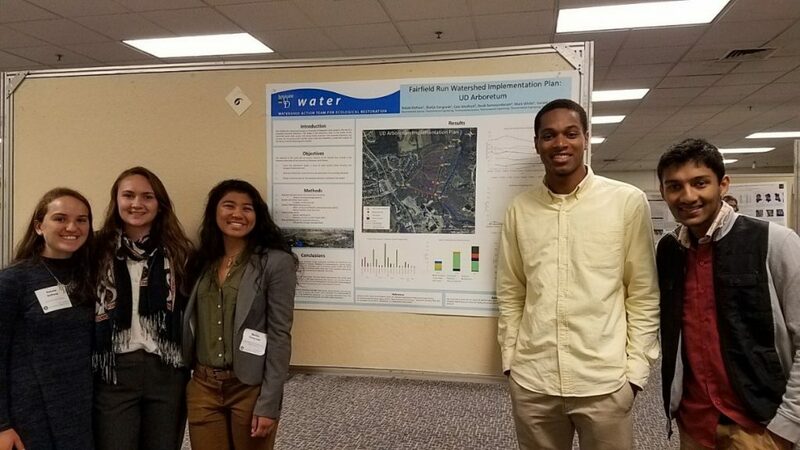 Abstract: UDWRC water research interns have sampled the White Clay Creek, where turbidity levels have been rising. 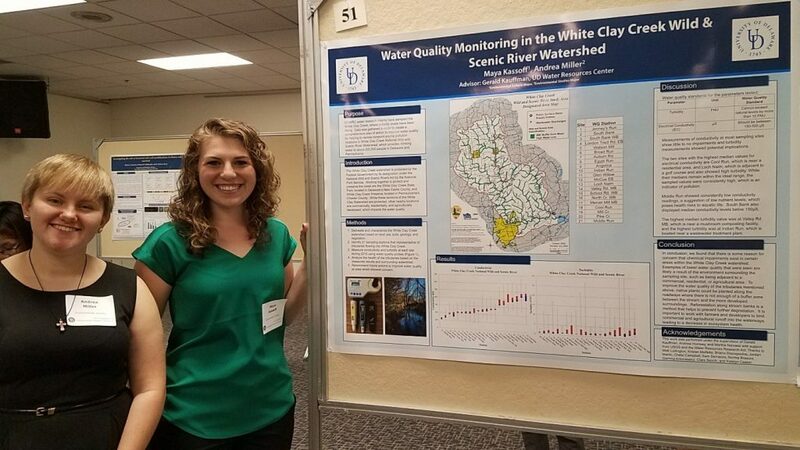 Data was gathered in order to create a comprehensive plan of action to improve water quality by helping to narrow nonpoint source pollution locations in White Clay Creek National Wild and Scenic River Watershed, which provides drinking water to about 200,000 people in Delaware and Pennsylvania. The White Clay Creek watershed is protected by the Federal Government by its designation under the National Wild and Scenic Rivers Act by the National Park Service. Working together to protect and preserve the creek are the White Clay Creek State Park, located in Delaware’s New Castle County, and White Clay Creek Preserve, located in Pennsylvania’s Chester County. While these sections of the White Clay Watershed are protected, other nearby locations are commercially, residentially, and agriculturally developed, which impacts the water quality. In conclusion, we found that there is some reason for concern that chemical impairments exist in certain areas within the White Clay Creek watershed. 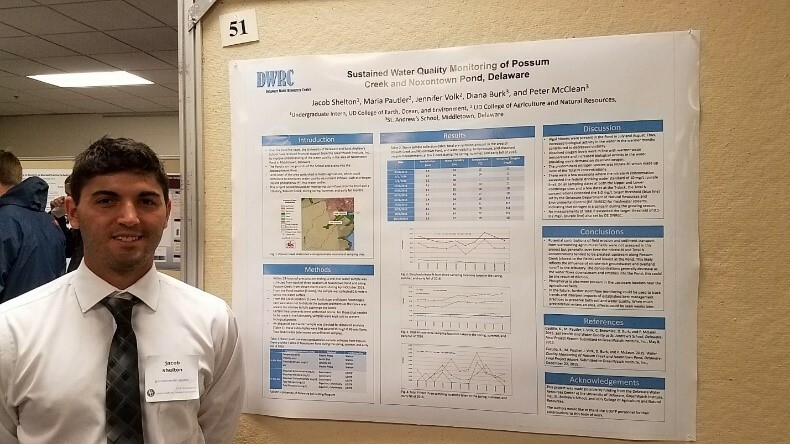 Examples of lower water quality that were seen are likely a result of the environment surrounding the sampling site, such as being adjacent to a commercial, residential, or agricultural area. To improve the water quality of the tributaries mentioned above, native plants could be planted along the roadways where there is not enough of a buffer zone between the stream and the more developed surroundings. Reforestation along stream banks is a method that helps to prevent further degradation. It is important to work with farmers and developers to limit commercial and agricultural runoff into the waterways, leading to a decrease in ecosystem health. Abstract: Analyzing smaller entities of the water movement in tidal salt marshes can advance the understanding soil-water-vegetation interface and its potential implications in ecosystem processes. 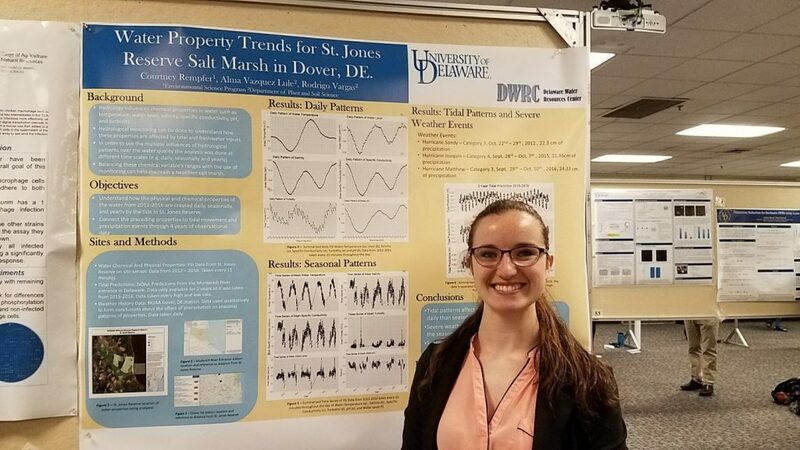 St. Jones Reserve in Dover, DE is a brackish salt marsh that experiences a semi-diurnal tidal pattern, which influences the properties of the water column at different time scales (daily, seasonality and yearly). The following study analyzes observations of chemical and physical properties in the water column and connects them to tidal movement and precipitation events through 4 years of observational data at the St. Jones Reserve tidal saltmarsh. It was found that tidal patterns affect the properties daily pattern while seasonal climate affect the properties seasonal pattern. Abstract: Stemflow has a significant impact on chemistry of both the tree and the surrounding environment. 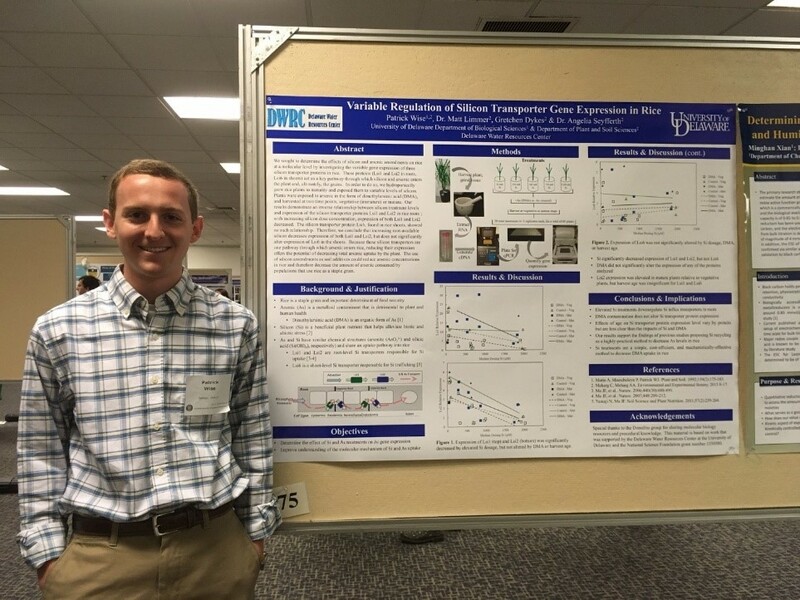 This study sought to understand the movement of water through a forest canopy of L. tulipifera using stemflow. By measuring isotopic ratios across an edge-to-interior transect, we were able to determine the amount of mixing in the canopy and effects of surrounding environment on nutrient input in the system. Although more sampling is yet to be finished, the preliminary results indicate that: (1) there is a significant input of anthropogenic nitrogen deposition in water on the edge of the forest; (2) there appears to be a seasonal effect of humidity on the amount of mixing between canopy water and the atmosphere. More sampling needs to be completed to confirm the validity of these results, but they give insight into the processes occurring in this forest stand. Abstract: To build on past water quality monitoring efforts in Noxontown Pond and a tributary (Possum Creek), as well as recommendations that were developed for best management practices on surrounding agricultural lands to deter nutrient inflows, this project’s focus was to continue sampling after stormflows into and out of the Pond in the spring, summer, and early fall months of 2016. This completed an all-seasons monitoring scenario and collection cycle that was initiated in the winter of 2015. Samples were taken at three locations: both footbridges over the creek and the T-dock on Noxontown Pond itself. Total precipitation amounts were recorded; rainfall varied from about half an inch to over five inches. In situ measurements of temperature, visibility, dissolved oxygen, and pH were made. A one-liter sample was collected at each of the three locations for laboratory analysis. Each sample was analyzed for dissolved ammonium nitrogen (ammonium-N) and nitrate nitrogen (nitrate-N), dissolved orthophosphate (ortho-P), total nitrogen (Total N), and total phosphorus (Total P). It was found that: Algal blooms were present in the Pond in the summer, thus, increased biological activity in the water in the warmer months contributed to decreased visibility. On a few occasions, the nitrate-N concentration exceeded the federal drinking water standard of 10 mg/L and the Total N concentrations exceeded the 3.0 mg/L target threshold set by the Delaware Department of Natural Resources and Environmental Control (DNREC) for freshwater streams. This indicates that nitrogen is a concern during the growing season. No measurements of Total P exceeded the target threshold of 0.1-0.2 mg/L also set by DNREC. If cover crops had indeed been planted in fields that drained to the Creek and/or Pond then that could have lowered the potential for sediment particles containing phosphorus to enter the waterways through overland runoff during and after precipitation events. Abstract: We sought to determine the effects of silicon and arsenic treatments on rice at a molecular level by investigating the variable gene expression of three silicon transporter proteins in rice. These proteins (Lsi1 and Lsi2 in roots, Lsi6 in shoots) act as a key pathway through which silicon and arsenic enters the plant and, ultimately, the grains. In order to do so, we hydroponically grew rice plants to maturity and exposed them to variable levels of silicon. Plants were exposed to arsenic in the form of dimethylarsinic acid (DMA), and harvested at two time points, vegetative (immature) or mature. Our results demonstrate an inverse relationship between silicon treatment levels and expression of the silicon transporter proteins Lsi1 and Lsi2 in rice roots; with increasing silicon dose concentration, expression of both Lsi1 and Lsi2 decreased. The silicon transporter protein Lsi6, found in rice shoots, showed no such relationship. Therefore, we conclude that increasing root-available silicon decreases expression of both Lsi1 and Lsi2, but does not significantly alter expression of Lsi6 in the shoots. Because these silicon transporters are one pathway through which arsenic enters the plant, reducing their expression offers the potential of reducing total arsenic uptake by the plant. The use of silicon treatments as soil additives could reduce arsenic concentrations in rice and therefore decrease the amount of arsenic consumed by populations that use rice as a staple grain. 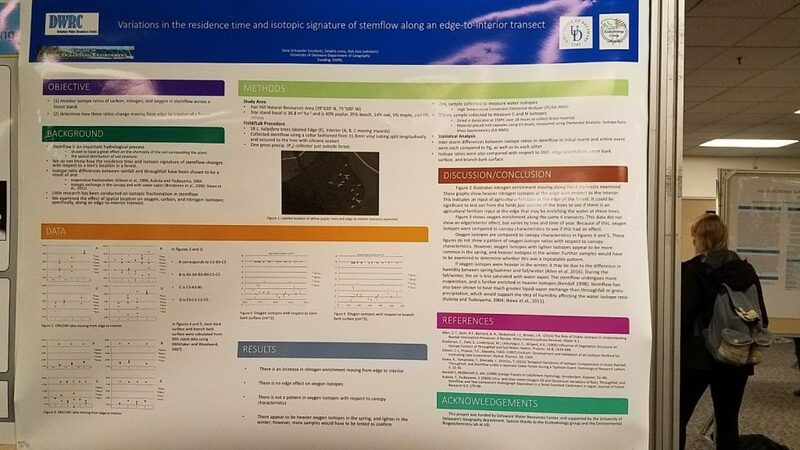 Abstract: The objective of this study was to conduct research on the Fairfield Run in the Piedmont of the University of Delaware Laird Campus to assess watershed health in terms of water quality, forest diversity, and biological habitat potential, delineate Fairfield Run watershed, analyze water quality, and evaluate stream habitat/forest health. The Fairfield Run watershed at the University of Delaware’s Laird campus is the site of a proposed university arboretum. The design of the arboretum relies on the health of the watershed: good water quality and strong habitat potential. Impervious surface runoff is the main contributor to high turbidity in Fairfield Run and Blue Hen Creek. The most feasible improvements that can be made include: increasing the number of pool v. riffle zones, decreasing bank erosion, and increasing riparian vegetation. More structural heterogeneity in the area will increase biological potential and encourage a stable ecosystem, increasing the value of the proposed arboretum. Watersheds with less anthropogenic interactions had higher tree density, species diversity, and increased maturity. Therefore, the areas closer to campus may require forest restoration.